After our performance, we will be setting up a huge drum circle and inviting people of all ages to come and join in with our uplifting, high energy African drumming and African dance workshops. 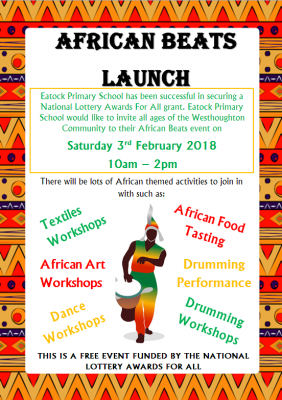 Also on the day, there will be a whole selection of other activities including African Art, textiles and food tasting workshops, the even better news is that the event is totally free! Eatock primary school has been awarded funding from the national lottery awards for all grant. 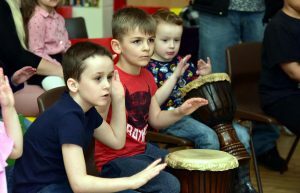 With this funding the school has purchased 45 djembe drums and as well hosting the African beats launch event, will be running an eight-week after-school course aimed specifically at boys and their dads! Drumroots will be providing the tuition for the course and preparing the guys for a spectacular African drumming performance at the end. We are really looking forward to the African beats launch event on the 3rd February and the after schools course and performance and can't wait to get rehearsing with the Lads and Dads! For a minute I was like, wow who’s the special guest from east Africa lol! Wow so honored and can’t wait to join you all! Hey, it’s a special surprise, don’t tell anyone!! Looking forward to you joining us, I’m assuming you will have only just have stepped off the plane?